The Soyuz MS-06 launched from the Baikonur Cosmodrome in Kazakhstan to the International Space Station at 5:17 p.m. EDT Tuesday, Sept. 12 (3:17 a.m. Baikonur time on Sept. 13). 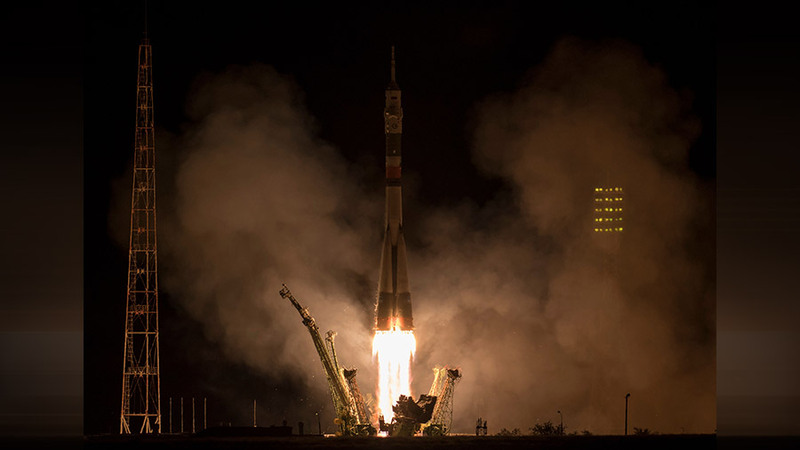 About five minutes prior to launch, the space station flew over the launch site and was flying about 250 miles above southern Russia, just north of the northeast border with Mongolia, at the time of launch. Expedition 53-54 Flight Engineers Mark Vande Hei and Joe Acaba of NASA and Alexander Misurkin of Roscosmos are now safely in orbit. The crew will orbit Earth four times en route to the spacecraft’s arrival and docking to the space station, at 10:57 p.m. Tune in at 10:15 p.m. to NASA Television or the agency’s website to watch the docking live. This crew marks the first long-term increase in crew size on the U.S. segment from three to four, allowing NASA to maximize time dedicated to research on the International Space Station. Highlights of upcoming investigations include demonstrating the benefits of manufacturing fiber optic filaments in a microgravity environment, a new study looking to slow or reverse muscle atrophy in astronauts during spaceflight and exploring the ability of a synthetic bone material capable of adhering bone to metal within minutes to accelerate bone repair. How do I get to replay the launch. I couldn’t get to the proper site today and Mark is my nephew.